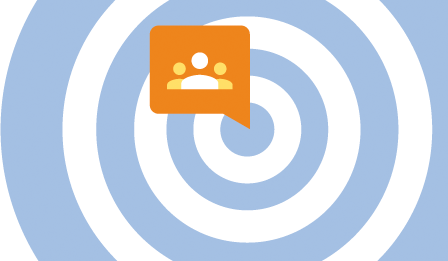 Retargeting is a proven tactic that provides great ROI. Why wouldn't it be? If you can get past the sometimes-creepy idea of ads following you around the web, it makes complete sense why it would be so effective. Users wouldn't be on your site if they didn't have at least some interest in your product. Getting into retargeting isn't too hard, and thanks to a somewhat recently released feature of Google Analytics, it can be really powerful. In this post I'm going to walk through the relatively painless setup process, then provide some examples that should demonstrate the immense utility of retargeting. First, it's important to mention that retargeting can be done well without Google Analytics. There are a number of ad networks and platforms that specialize in retargeting such as ReTargeter, AdRoll, Chango, and FetchBack. Prior to the this feature making its way into Google Analytics, Google's AdWords allowed users to put a separate snippet across their entire site to capture visit data for creating lists within the AdWords interface. The rules for creating a list were based solely on the URLs visited. It's easy to create a list that has just users that have converted by including those that have visited your confirmation page. We could get a little more advanced by including multiple snippets. With some funky server side logic, it'd be possible to only print "retargeting snippet B" when, for example, the user came from organic, had visited 10 pages already in this session, and had added an item to their cart. I'd consider getting server-side logic involved a high-barrier-to-entry situation, and one I'd like to avoid, especially if the marketer doesn't want to get IT involved. That's what makes Google Analytics's remarketing so powerful. If you can install a Google Analytics snippet, you can install a remarketing snippet. In fact, if you already have the most up-to-date version of the GA snippet installed, you only have to make one teensy change and you're on the train to remarket-ville. Okay, now that we've adjusted the GA snippet, we're able to completely done with on-site changes. Yup! No need to bug anyone in IT to drop a new snippet on the site ever again. Everything else can be handled within the Google Analytics and AdWords interface. So now we head to GA's admin section and create a new list. By default we have 4 options, the first two are basic remarketing abilities that we had before with regular AdWords remarketing. The third option is very cool. We can create a list of users that have completed one of our Google Analytics' goals. This might make the creation of a 'converted visitors' remarketing list even easier than before, but beyond that we can take any goal we're tracking in GA - whether that be simple URL destination, visit duration, pages/visit, or events - and create a list. We'll get into some examples later. 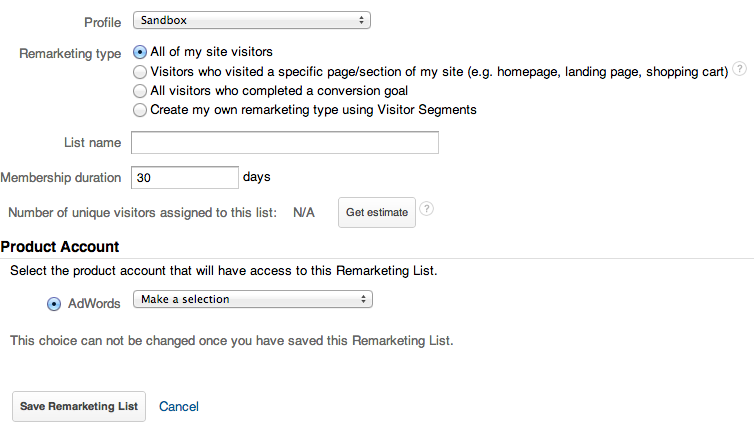 The last option for creating a remarketing list is completely, 100%, without-a-doubt, absolutely, rad. Google calls them visitor segments, which is, in practice, pretty similar to the advanced segments we deal with in Google Analytics all the time. 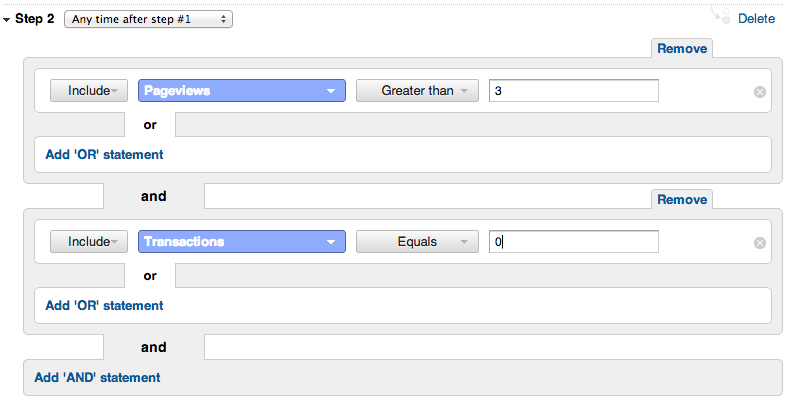 This is what makes Google Analytics remarketing list creation so much more powerful than list creation in AdWords. Nearly every dimension and metric that we can apply to our GA reports can be used to create a segment. Custom variables, source, medium, keyword, visits, transactions, pageviews, and on and on - All can be used (and combined) to create a list. Not only that, but lists can be created based on the sequences that these scenarios are taking place (say, we want to require the user comes from site A, then later lands on our site via organic to be included in this list). But enough of the hypothetical, let's demonstrate some ideas for creating lists. I think things will make a lot more sense. There's been too many hypotheticals thus far, so let's make it real simple and real-world. 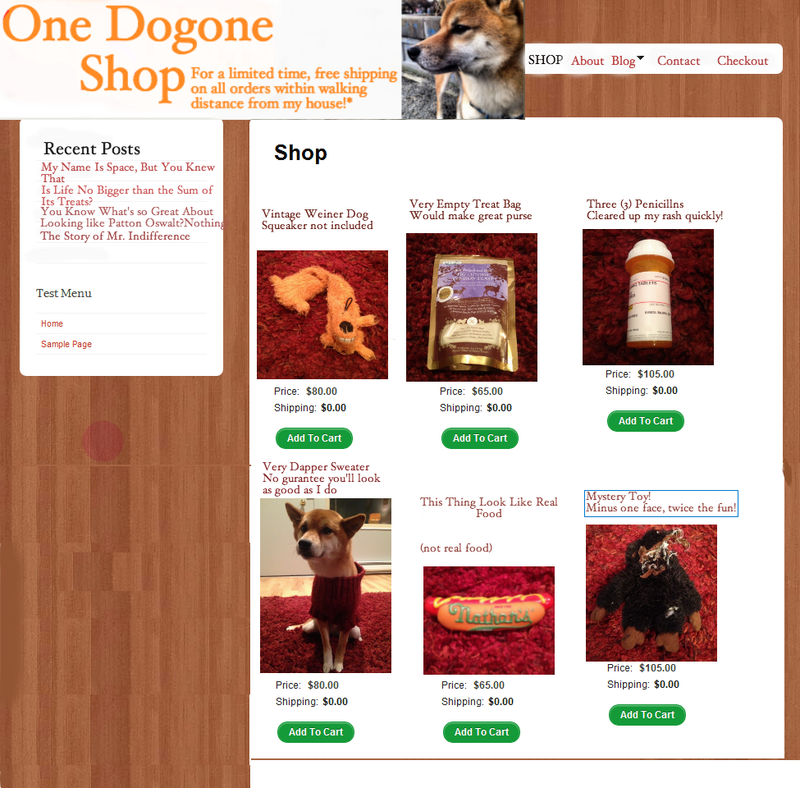 Let's just suppose that my dog, Space, decides to add an eCommerce element to his blog. Create a list of the big spenders and create an ad announcing a new high-ticket product. Create a list of just users that first visited via Twitter that bounced. Then create an ad that invites them back. "Hey, I'm not here to sell you anything (just yet), come on back and just get to know me a bit!" Create a list of users that viewed a particular product, then retarget them when it goes on sale with an ad announcing the sale. Create a list of users that had added something to their cart, but didn't convert. Then target them with an ad that offers a coupon code to complete the purchase. Create a list of users that watched his sales video, then visited at least 4 pages, but never converted. Hopefully you get the idea, and some ideas spring to mind. Obviously, some of the above examples are a little silly, but since Google Analytics lets us test the size of the segment before actually creating the list (see the "get estimate" button a few images up), you should have get a good idea of whether or not this list is worth the effort. What say you? Does Google Analytics remarketing float your boat? Or is there something else out there that floats your boat? Besides water.